Concrete has many uses. When we think of concrete structures, we might first call to mind skyscrapers touching the clouds. Our thoughts might turn to massive pillars holding up the overpasses of superhighways. We might be reminded of monuments to sports like the Rogers Centre, home to our own Blue Jays. Looking out rather than up, there are kilometres of city sidewalks or the excitement of a skate park. However, we often overlook the many designs and artistic touches that can be part of concrete surfaces around our cities, homes and businesses. Exposed aggregate is a type of concrete where a thin top layer of concrete is removed to expose the gravel or sand that’s always part of the mixture but usually hidden. Sometimes, crushed glass or quartzite is used instead of gravel. Different sizes of gravel also help create the unique final effect you want. The end result is a textured surface that brings natural beauty to the material. 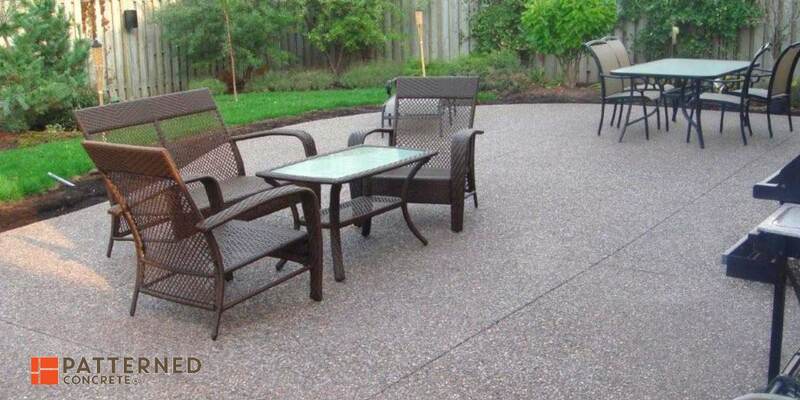 Nowadays there are many types of decorative concrete, but exposed aggregate could be called the original. It’s been in use for over a hundred years. Still, it never goes out of style. It offers a timeless appearance that also has practical advantages. There are a number of benefits when you choose stamped concrete. Let’s have a look at a few of them. Of course, the most obvious plus you’ll get when you choose this material is its great appearance. You’ll enjoy the three-dimensional surface and the natural appearance and colors of the aggregate. Another benefit is the increased traction that’s provided by this material. Since the surface is irregular, it’s much easier to keep your footing or to drive over, even in wet or icy conditions. And depending on your needs, you can elect to have the aggregate stick out at different levels. A surface with more relief gives you more grip, while lower relief still provides grip but is more comfortable to walk on. 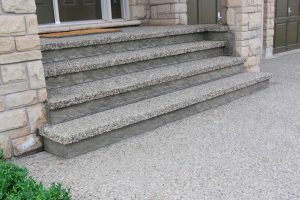 Of course, you’ll also get the great durability and ease of maintenance that comes with any concrete product. It will last fordecades. If repairs become necessary for cracks or other issues, they are usually not difficult to do. Maintenance is also straightforward. The surface can be swept or hosed off. Other than that, it just needs to be resealed every couple of years. The aggregate will hold its color and overall appearance. In fact, it’s probably the easiest type of decorative concrete to maintain. A final benefit is that exposed aggregate is among the least expensive types of decorative concrete. It’s an affordable alternative when you want something more than the look of plain, boring concrete! Nearly any type of concrete work can be completed using exposed aggregate. Let’s talk about a few of the most popular uses!. An exposed aggregate driveway, for instance, gives your vehicle extra traction to reduce slipping when there’s ice, snow or rain. And of course, the same principle applies when you get out of the car, too. You might even want to extend it to your sidewalks and walkways to provide a more secure footing. Another place where a little extra traction is helpful is around the swimming pool. Of course, you might want your pool deck to be less rough than your driveway. But that’s easy to do with this type of surface. It just calls for a smaller aggregate or one that is not as deeply exposed. When you want the facade of your business or home to stand out, exposed aggregate is a great choice, too. The great looks and durability will attract all the right kinds of attention. One more example is sound barriers. Often, this material is used to dampen noise because the uneven surface helps reduce echoes and absorb sound waves. These barriers are common along highways but are also used in other places. The material will hold up for years without issues. This is far from a complete list of course! There are so many possibilities and exposed aggregate can fill any needs. We’re not going to provide a how-to guide here, but we do believe that customers should know what’s involved in the process of installation. So let’s quickly look at what goes into installing exposed aggregate. First, it’s important to understand that all concrete mix contains some type of aggregate. It’s an essential part of the mix. The concrete adheres to these larger particles as it dries, making the concrete more durable and stable. 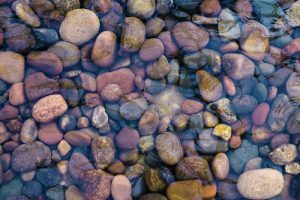 Depending on what you want to see on the surface, the regular aggregate can be switched out for something more suitable – perhaps larger or of a different color. The beginning of this process is identical to how any concrete is poured. The surface is smoothed and leveled. Of course the larger, heavier pieces – the aggregate – is going to sink down while the lighter concrete remains on the surface. Any pieces that stick out at this stage are pushed down just below the surface as it’s smoothed. What makes the process unique is exposing the aggregate that’s already there. To do that, a thin layer of the concrete is washed away. Of course, this requires knowing when the concrete has hardened enough to stabilize the aggregate, but not so much that it’s too hard to wash away. The first step in exposing the aggregate is by spraying it down with water. The gravel should stay in place if your contractor has waited long enough. The contractor washes away enough of the concrete to achieve the depth that you want in the aggregate. If the concrete’s hardened too much, it might require a lot of scraping with wire brushes or other tools. Normally though, these tools are just used to provide a bit of finish to the surface. Once the aggregate is exposed to the right level, the surface can be cleaned and stray cements smoothed around the aggregate, leaving you with a magnificent new surface! During our decades in the business, Patterned Concrete® has developed our own methods to achieve a unique process that we call Gemento. Using the basic principles of exposed aggregate, we’re able to achieve a more durable and more attractive surface. If you’re interested looking for exposed aggregate in the Toronto area, please get in touch with us for an estimate. If you’re outside the GTA, look for the Patterned Concrete® franchise nearest you!